Cowboys herd bulls at a cattle feed lot in the Amazon on June 28, 2017, near Chupinguaia, Rondonia state, Brazil. The confinement farm currently holds about 38,000 head of cattle and employs around 125 full-time workers. At peak capacity the farm dispenses around 900 metric tons of feed to the cattle per day. Brazil is the world's largest exporter of red meat and poultry and annually exports more than $12 billion per year. Brazil holds 212 million head of cattle—the largest herd of commercial cattle on the planet. KimE12 Uploaded by KimE12 on Feb 12, 2018 . Herding the bulls - Desktop Nexus Animals Download free wallpapers and background images: Herding the bulls. Desktop Nexus Animals background ID 2351478. Cowboys herd bulls at a cattle feed lot in the Amazon on June 28, 2017, near Chupinguaia, Rondonia state, Brazil. The confinement farm currently holds about 38,000 head of cattle and employs around 125 full-time workers. At peak capacity the farm dispenses around 900 metric tons of feed to the cattle per day. Brazil is the world's largest exporter of red meat and poultry and annually exports more than $12 billion per year. 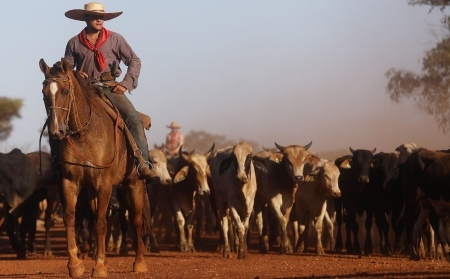 Brazil holds 212 million head of cattle—the largest herd of commercial cattle on the planet. nice picture and thanks for the info!